12 May 2008 WILL PRESIDENT MEDVEDEV'S FIRST CRISIS BE GEORGIA? 11 July 2008 "DE-RECOGNITION" OF GEORGIA'S TERRITORIAL INTEGRITY DISQUALIFIES RUSSIA AS "PEACEKEEPER"
Stories with this headline are doing the rounds, mostly originating in remarks made by Pavel Felgenhauer, a Russian military analyst who writes in Novaya Gazeta. He gave regular warnings about Russian troop build-ups in Abkhazia and South Ossetia before last year's August war, so perhaps his warnings should be headed. The recent remarks first appeared here ion the jamestown Foundation website on 12 Feb. While snow covers the Caucasian mountain passes until May, a renewed war with Georgia is impossible. There is hope in Moscow that the Georgian opposition may still overthrow Mikheil Saakashvili's regime or that the Obama administration will somehow remove him. However, if by May, Saakashvili remains in power, a military push by Russia to oust him may be seriously contemplated. The constant ceasefire violations could escalate to involve Russian servicemen - constituting a public casus belli. The desire by the West to "reset" relations with Moscow, putting the Georgia issue aside, may be interpreted as a tacit recognition of Russia's right to use military force. Otherwise, dozens of Russian tanks and artillery systems, fully ready for attack, are located in Akhalgori district, some 35 kilometers (22 miles) from Tbilisi, the capital of Georgia. And nobody knows who will pull the trigger first. At the same time, however, the Ministry of Internal Affairs has intensified its efforts to expose the enemies of the country and is performing the functions of the special services as well. On January 21 two locals of Armenian nationality, Griogor Minasyan and Sarkis Akobjanyan, were detained. The two live in the Samtskhe-Javakheti Region of Georgia, which is densely populated by ethnic Armenians. 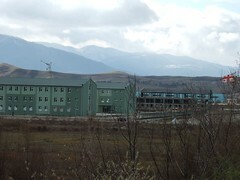 According to official information released by the Ministry of Internal Affairs, "they were detained [for] forming an armed unit, its preparation, and espionage" (www.presa.ge, January 23, 2009). The detention of Minasyan and Akobjanyan was the second arrest on charges of espionage in the last two years in Georgia. In September 2006 Georgian Special Forces detained four Russian officers of the Russian Military Headquarters in Georgia. The detentions received widespread coverage in the media, and an attempt to turn the arrests into a public relations show, was soon followed by a rapid deterioration in relations between Russia and Georgia, which ended in the massive deportation of Georgians from Russia and the suspension of air connections between the two countries (Arsenali, February 21, 2009). Bakradze Warns Russia May Try to Incite Chaos in Georgia Civil Georgia, Tbilisi / 27 Feb.'09 / 19:13 Parliamentary Chairman, Davit Bakradze, said on February 27, that resumption of large-scale military hostilities was not likely, but warned that Russia might try to incite chaos within Georgia to achieve its goal. “Russia’s indirect involvement in the country’s internal politics and inciting internal political instability is more dangerous than direct military aggression, because eventually the instability and chaos can be more effective rather than tanks for replacing the authorities,” he told a group of students at a meeting in the Tbilisi-based Caucasus School of Business. All the old politicians and the young ones who have fallen out with Saakashvili have formed opposition parties, all of which are calling for demonstrations in April, but they haven't agreed on the start date of the demonstrations, let alone whether they will demonstrate "together", so what hope of a common policy or plan to oust Saakashvili and form a coherent government. Nino Burjanadze (a rumoured favourite of Bush for a replacement) is now deciding she will go back into politics instead of running a think tank. Not much signs of any thinking coming out from her. For a further character assassination read here, where she is described as "nye ryba, nye miaso"*. As an Iron Lady of Georgia (she admires Margaret Thatcher), she is a failure as she has turned too many times to be credible. But then comes more information about the plan of attack. Plan of Georgian occupation is worked out in the Kremlin, according to which Russian military forces will enter Tbilisi from Tskhinvali and Akhalgori and occupy North part of the city. Russian military expert Pavel Felgenhauer stated about it in interview to the paper 'Kviris Palitra'. According to his information, the second military campaign will start with minor incident, while Russian soldier dies and it will be used as reason by Moscow to start war against Georgia. 'Invasion of Tbilisi is planned. North side of Tbilisi, as Moscow considers that it is not necessary to invade the centre. According to our information, Russian army will occupy Vasiani, then – aviation factory and international airport. These objects are important, as Tbilisi stays without air aid if Americans desire to help you. Invasion will take place from Tskhinvali and Akhalgori and everything will be over by it', - Felgenhauer stated. The Russian expert says that there will be invasion from Abkhazia and the West Georgia will be occupied. Military expert says he has relations with his old fellow Grigory Karasin, who is foreign Minster of Russia and other military and political high rank officials. He also states that Georgian government has information about the plan. Felgenhauer states that this war with Georgia will be profitable for Russia to cover the existing financial depression in Russia. 'If war starts in Georgia, main goal will be to change Saakashvili's regime. It will automatically cause change in orientation. It doesn't matter who is brought by the Kremlin – Abashidze** or other. The Kremlin understands that they have to defeat armed forces of Georgia first and foremost. It is not so easy for Russians'. * Russian expression translated 'neither fish nor meat'. No third option as in English: neither fish nor fowl nor good red herring. **Aslan Abashidze was the previous leader of the Adjara Autonomous Republic in Georgia, till Saakashvili kicked him out and he went to Moscow. Well actually it was a visit to a sugar factory, but it was situated near Gori. I had the bright idea of making a video of the energy audit, we are going to do there, so we went to do a recce of what to film. The location caused a certain drama with the international engineer we were going to use, who preferred to believe what it said on the British Embassy website, rather than us, who had actually visited the plant and knew whether it was risky or not. Why he couldn't just say he didn't want to come before Christmas I don't know. We could see that reconstruction was going pretty fast. The bridge over the river at Gori has been replaced by a rather bouncy steel framed bridge and a new motorway is being built between Gori and Tbilisi. The official reason is that it is the new "Silk Road" linking Baku and Poti on the Black Sea for the transit of goods for the region. I assume it is US money and that is why they are building a road, rather than expanding the railway line, which would be more green. So next time the Russians visit Gori they will find it even quicker to get to Tbilisi. Various little villages of boxes like this have sprung by the side of the road. The boxes look rather pretty, but don't have bathrooms or toilets or heating. One can say they are definitely better than tents for the winter. Their cost per sq m is about the same as the posh normal housing built in Tbilisi, which comes with plumbing at least, even if not with heating or bathrooms (for some reason these are considered extras). Some people are remarking that builders and others are profiteering from other people's misery. Of course the view of the Caucasus mountains is a compensation, but judging by the usual tendencies, the IDPs will be there a long time. If one swallow doesn't make a summer how many swallows do? Rumours are circulating about another war. First just one person in our office (who was the first with the news of the August war) then today a quite unconnected source. A plan for war is given as the reason for the build up of Russian forces in Abkhazia and South Ossetia. Of course this is a provocation, but as long as they stay there it isn't so much of a problem. But no, there seems to be the idea that if Saakashvili has another go, it will distract from the 7th November opposition demonstration in remembrance of last year's confrontation. Of course it's all speculation. Let's hope it is all wrong. You would think that the Russians had enough on their plate at the moment, what with the oil price and the stock exchange collapse. And reorganising the military. So I'm glad I'm leaving for a bit. And just to add fuel to the fire, here is the latest from www.civil.ge. Today I heard a rumour about replacement of the Prime Minister. Not much time to blog at the moment, a sudden rush of work. So I am just quoting some extracts from EU Observer which seems to have a lot of coverage of Georgian issues at the moment. So it's not surprising the Geneva talks failed. Joseph Stalin is probably turning in his grave as police from the European Union patrol the streets of his home town, Gori, Georgia. The European Union's decision on 15 September to deploy a EU monitoring mission to this part of the former Soviet Union is indeed a significant step. And French President Nicolas Sarkozy, currently holding the rotating EU presidency, has to some extent been justified in heralding Russia's acquiescence to the mission as a clear victory for European diplomacy. But the constraints the EU faces are evident as well. Sarkozy felt he needed President Dmitry Medvedev's approval to deploy in a country in Europe's new neighbourhood with its own NATO and EU membership aspirations. Russian foreign minister Sergei Lavrov made it clear that the EU will not be welcome in South Ossetia and Abkhazia, entities Russia now recognises as independent states. For now the observers will be sent to confirm Russia's withdrawal from Georgia, particularly the towns of Poti and Senaki, and villages between Gori and the South Ossetian administrative border. Russia has pledged to withdraw by 10 October. A good start, but not nearly enough. Member states are going to have to push Russia much harder to guarantee that the mission will be able to work throughout Georgia, including in South Ossetia and Abkhazia. If the EU is unable to act in South Ossetia and Abkhazia, and if Russia completes its final withdrawal from the rest of Georgia, the mission's futility will rapidly become obvious. EU observers will be overseeing a fairly mundane return to normal life in a handful of towns and villages in western and central Georgia: including the ongoing return of some 127,000 displaced persons, reconstruction of their homes, and handout of humanitarian aid. Monitors will be unarmed and unable to intervene if any violence occurs. The best the EU's personnel can do is take testimony of what happened during the actual conflict and begin determining what crimes occurred. But a month or two should suffice for such work. Thereafter, the EU's presence will be superfluous in those areas. The Georgian president had no other option than to attack South Ossetia in order to save his country from a Russian coup, Andrei Illarionov, former advisor to Vladimir Putin has said in an interview with EUobserver on the margins of the "European Resource Bank" conference which took place in Tbilisi last weekend (9-12 October). The unilateral recognition of Abkhazia and South Ossetia by the Russian authorities seems to be a "plan B" that Moscow is not genuinely happy with, Mr Illarionov says. "It appears that plan A was to disorganize the Geogian government and society with some kind of civil war, coup d'etat or revolution, with the participation of Ossetians and Georgians within Georgia to change the regime." "But since Georgian troops went into Tskhinvali and were able for a number of days to keep the Russian army from moving into Georgia, it was enough time to relocate the rest of the army from the West of the country to defend Tbilisi, to attract world-wide attention, to 'wake up' the public and politicians around the world and to mobilise international support." "After a few days it became evident that plan A, to organize a revolution or civil war failed. The Russian authorities were forced to move to plan B. But it was a big frustration for the Russian authorities. When you hear bad words used by the Russian officials for Mr Saakashvili, it is just expression of their deep frustration that Mr Saakashvili was able to destroy their well-prepared plan A." "Plan B was that Russia is trying to defend the independence of South Ossetia and Abkhazia. This was made public only a few days after the war and ultimately they have chosen to pretend that they are in favour of their independence. But it is in deep contradiction with the position the Russian authorities have kept for so long, on non-recognition of Chechnya, Kosovo, Nagorno-Karabakh, Northern Cyprus, Transdnistria." "The last thing that Russia needs is these [Georgian] breakaway regions. It's a big problem for the Russian government. It's a serious financial drain, they're not quite sustainable and there's a big criminal problem as well ... All of a sudden you have tens of thousands armed people who can easily enter Russian territory. It's an incredible headache." As EU leaders in Brussels meet to debate Russia relations and diplomats in Geneva discuss Georgian security, one Polish aid worker aims to remind politicians of the stark realities of the conflict via a vandalised flag. "The Russians attacked the university in Gori, which was shelled with high-calibre ordnance," he said. "When we entered we saw fires, books scattered everywhere. Then we noticed how the Russian soldiers had attacked the university flag and the EU flag, which was full of holes from bullets and bayonets. This symbol of the EU countries and of Georgian aspirations was an object of direct physical hatred." The medical worker picked up the flag and aims to pass it on to European Parliament President Hans-Gert Poettering in the coming days, to show the war was not just a scrap over bits of Georgian land, but a clash between two bordering ideologies and "empires" - the EU and Russia. "The parliament should keep this as a sort of museum piece," Mr Wlaszczyk said. "It shows, among certain parts of Russian society, the Russian attitude toward the EU. EU countries should realise that this is being seen as a conflict between two empires." Based on first-hand witness accounts from Georgian refugees and the wounds of patients examined at his hospital, the aid worker accused Russian forces of planting booby traps in Georgian homes as they retreated, some of which were concealed in children's toys. But his most vivid memory is the aftermath of a Russian air strike on a kindergarten in Gori, which caused the roof to collapse.